Twitter launched its so-called dark mode a few months back. This feature is actually called night mode which is actually a dark navy, rather than black or grey. This theme allows users to opt for a dark background with white text. But many users are not happy with it. They complain that the background of night mode is more blue than black. Finally, Twitter for iOS gets improved Dark mode which was much needed. Light Out Dark Mode for iPhone will improve your smartphone’s battery life. Twitter announced the launch of ‘Light Out ‘today and the best thing is that this mode ditches the blue colour used by standard dark mode and has replaced it to the Black background. Even a few days back, a Twitter user told CEO Jack Dorset that the background colour of night mode is very annoying and “Weird blue”. On this Dorsey replied” will Fix”. So it means soon users will be able to see the improved Night mode. 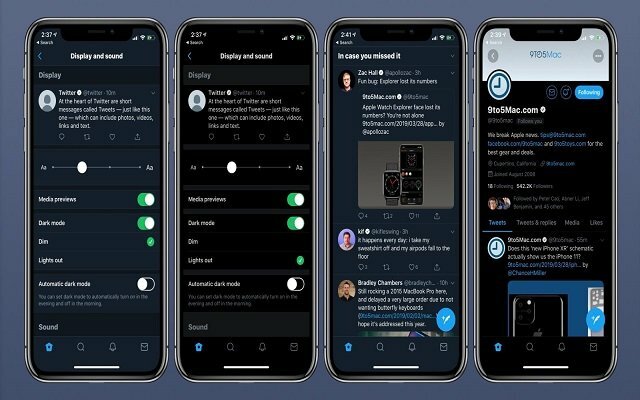 Twitter’s new dark mode will be more pleasing and will save more battery life of your device. Moreover, it will put less strain on your eyes. To access it, you need to go to Display and sound menu in the settings, activate Dark mode and then select light out.